BTV, Solar To Air NCRUCLAA | Servinio's Sports Etc. Athletic Directors and Coaches in a show of force at the recent television contract signing of the NCRUCLAA. 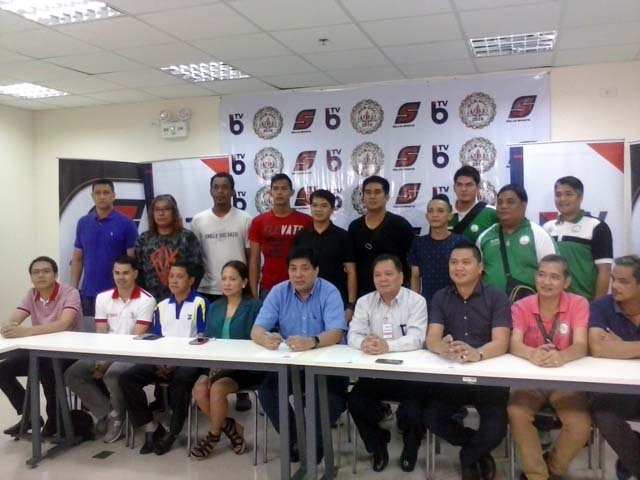 THE NEWLY-organized National Capital Region Universities and Colleges of Luzon Athletic Association (NCRUCLAA) recently formalized its agreement with Solar Entertainment Corporation to air the games of their maiden season over Basketball TV and Solar Sports beginning January 17, 2017 at the Cuneta Astrodome. No less than sixteen schools will compete for supremacy on the Basketball court in the Seniors, Juniors and Women’s Divisions. Comprising the pioneer membership are Asian Institute of Maritime Studies, Colegio de San Lorenzo, De La Salle University-Dasmarinas, De Ocampo Memorial College, Don Bosco Technical College, Emilio Aguinaldo College-Cavite, National College of Business and Arts, Olivarez College, PATTS College of Aeronautics, Philippine Merchant Marine School, Philippine School of Business Administration, Philippine State College of Aeronautics, Rizal Technological University, Saint Francis of Assisi College System, Technological Institute of the Philippines and University of Makati. Engr. Ted Cada, the Athletic Director of host school AIMS, is the league’s President. In a show of force and unity, Engr. Cada led a full delegation of all the member schools’ Athletic Directors and Basketball coaches during the contract signing rites at the Solar offices in Mandaluyong City. Vice President for Sales and Marketing Raffy Veloso signed on behalf of Solar. Aside from Basketball, the NCRUCLAA is looking to be the first collegiate sports organization to stage an official 3X3 tournament. Other sporting disciplines on tap are Swimming, Cheerleading, Indoor Volleyball, Beach Volleyball, Chess, Table Tennis, Badminton and Taekwondo. This entry was posted in Badminton, Basketball, NCRUCLAA, Sports, Table Tennis, Volleyball. Bookmark the permalink.